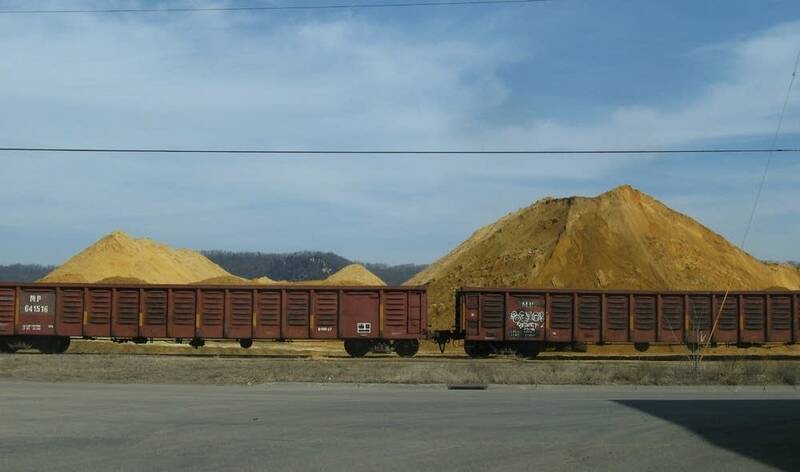 A one-year moratorium on silica sand mining in Winona gives officials time to study the issue, but some city residents wonder how well equipped leaders are to make the decisions ahead. Silica sand, often referred to as frac sand, is a hot commodity because it's used to extract oil and natural gas from the ground in a process called hydraulic fracturing, or fracking. Read a MPR News primer on frac sand mining. Winona City Council members approved the moratorium last week. 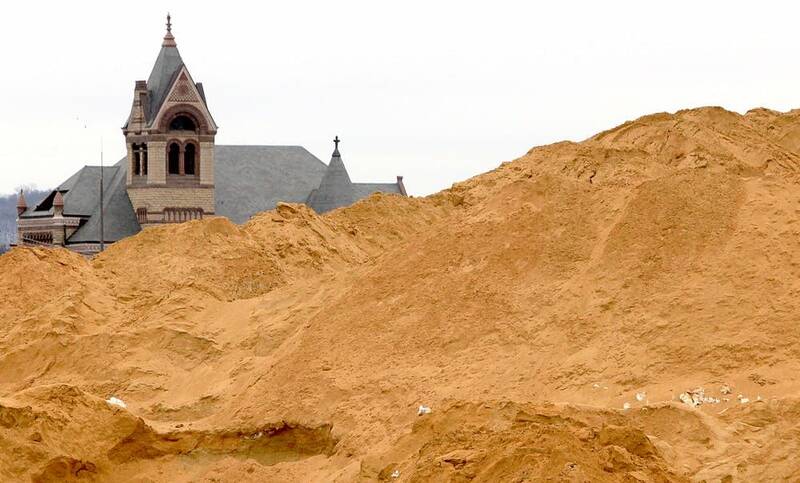 The moratorium puts a hold on any expansion or new operations for a year, though it doesn't affect the existing sand mining within city limits. The trucks and dust from these existing facilities have drawn widespread condemnation from residents. But there are also serious questions about the health and environmental impacts of silica sand mining. Studies have shown breathing in fine silica sand particles can cause lung problems. Sitting at a cafe across from City Hall, Winona resident Jim Gurley said city officials have not been prepared to make decisions about this industry. "A lot of the officials that are making the decisions about this issue really don't know a hell of a lot about it," Gurley said. "Some of them are well researched and some of them have taken a real interest, but others have not. Gurley applauds the council for passing the moratorium. "The city has been dragged, kicking and screaming, by the citizens to even come to this point to say, 'Yes, we should look at this,' " Gurley said. "But it's after the horses are out of the barn. The horses being the operators that have set up camp in the city with many frac sand operations, where they're processing, washing, drying and transporting frac sand." Winona Mayor Jerry Miller is unapologetic about the role industry plays in his city. He said while the city offers a bucolic life for many residents, Winona is a transportation hub and a working city. The port and rail line attract hundreds of trucks carrying commodities in and out of southern Minnesota every day. "They're all worried about frac sand," Miller said. "If it's not frac sand bringing more trucks in, it's fertilizer, it's coal, it's corn, it's wheat. It's going to be something. Miller said council members are learning about the issue like everyone else in town. Miller said the moratorium will give officials time to sort through the patchwork of city laws that regulate mining operations. It will also clarify how the city will work with the Minnesota Department of Natural Resources and the Minnesota Pollution Control Agency — the state agencies that issue permits to regulate storm water, air quality and water usage on these sites. "My main concern is the health issue," Miller said. "If that's taken care of and we can show that we're monitoring that and that it's meeting the Minnesota Pollution Control specs — the trucks and that we can handle." But trucks are perhaps the most visible concern people in Winona have when it comes to the sand industry. At a public hearing this week, resident Marilyn Bjorlo questioned how council members will regulate a plant proposed for her neighborhood. "During the operation of this plant, who's going to be responsible for monitoring the air? What kind of collection equipment will be used? What will be the frequency of the air sampling?" Bjorlo asked. Nearly all of the 15 or so people who spoke at the hearing shared Bjorlo's concerns about what city officials will do during the one-year period. Another resident, Ron Stevens, suggested the city use the moratorium to work with other cities and counties also grappling with the silica sand. "It's probably bigger than what the city can handle," Stevens said. "We need to collaborate and be integrated with other entities that can help address these concerns." Winona County has a separate moratorium on sand mining expansion that expires in May. City officials say there might be enough processing capacity in existing washing and drying facilities to accept more sand if new mines move ahead outside the city limits. Assistant City Planner Carlos Espinosa said there's a middle ground when it comes to the issue of sand in the region. "I think there's a way that you can put in sufficient regulations to allow these uses to continue to operate, but also make sure people in the cities and in the counties and in the region are being taken care of and that the government is providing for their health, safety and welfare," Espinosa said. Espinosa said it's up to city to create a committee comprised of city and industry leaders, scientists and residents. Once formed, the group will report to city officials and address the major health and environmental concerns with sand mining.